violina had the most liked content! JG’s Hong Kong press conference 20190309 Video source – https://www.youtube.com/watch?v=bqvU9Rw_c1E - Q. Welcome to Hong Kong. Please say hello to your fans here. JG – Hi, guys. (JG says greetings in Cantonese; Cantonese >) This is Lee Joongi. I’m so happy to be here. I’ve been waiting to meet you guys so much. Hong Kong, you’re so BEAbeautiful. Thank you. (Now in Korean >) I really missed you guys. (To translator) What’s “I missed you” in Cantonese? (Cantonese >) ‘I missed you.’ (Korean >) It feels so, so great being in Hong Kong. (To someone off screen) Nice to meet you. You’re so beautiful. (English >) All the Hong Kong people are very beautiful. (Korean >) I didn’t know you have this awesome shopping mall in Hong Kong. Are you guys really here for shopping? Is there any other reason? (To translator) What’s “Did you miss me?” in Cantonese? (JG speaks Cantonese) (Korean >) I really am very thankful to have so many people welcoming me. - Q. Shall we have a seat and continue? JG – Yes! - Q. How do you feel coming back to tour in Hong Kong after two years? JG – I am really happy. I am very sorry I feel like I haven’t kept my promise to my Hong Kong fans sooner. (English >) But thank you for your super welcoming me. Super thank you. Super thanks to all of you. Thank you so much guys. Love you all, Hong Kong. - Q. You said ‘I missed you’ to Hallyu fans in Cantonese. What impression do you get from your Hong Kong fans? JG – The Hong Kong fans are always passionate. That’s why I’m looking forward to tomorrow. Are you ready to party tomorrow? (English >) Are you guys ready for party tomorrow night? Really? I can’t hear you. Beautiful Hong Kong people, make some noise! (JG says something in Cantonese) - Q. Oppa’s Cantonese pronunciation is so good. We’re told you prepared a lot for your Asia tour. Can you give us a little bit of a hint [on tomorrow]? JG – That’s a top secret. It’s a top secret. But instead, it’s not just because I haven’t been here in Hong Kong in a while, but it also marks the last show of my Asia fan meeting tour. All my staff are feeling really sorry. So tomorrow, not just me but all my crew on this Asia tour will literally put everything they’ve got into the Hong Kong show. That’s all you need to know. - Q. There are lots of directors and actors in Hong Kong. Who would you like to collaborate with? JG – I say this every time I come to Hong Kong and do an interview, but I spent my adolescence watching Hong Kong movies. Growing up I respected many Hong Kong actors and directors. So Hong Kong feels so familiar to me. If I can, I’d be very honored and happy to work with any director or actor. I mean, you guys can recommend anyone to me on the social media. Here, you guys have a lot of awesome artists. I’d be very happy to work in Hong Kong. Q. We’d love to see you with Hong Kong actors on the big screen. JG – (To moderator) Let’s work together. - [Taking questions from the press] Q. I’ll ask you questions we get from the press. JG – Looking forward to it. - Q. You are now here to meet your fans in Hong Kong after two years. What part of Hong Kong did you miss the most? JG – First of all, of course, it’s the fans. I really felt sorry. But my Hong Kong fans have always sent me endless support on the social media or the Internet, and for every event or fan meeting I’ve had, they have always given me support. So I have always felt (their support). I prayed I’d be able to see them again as soon as possible. Whenever I work on a project, my Hong Kong fans – as other overseas fans have supported me – are famous for always showing passionate and enthusiastic support. So I am looking forward to it tomorrow. - Q. If you have free time during your tour in Hong Kong, which must-see places do you want to go? Like tourist attractions or famous restaurants… JG – Why don’t you guys recommend me some places? Where should I go? Could you guys recommend for me? Your home? ‘Let’s go home?’ I don’t think I can go to the homes of so many people here. But my wish is… Whichever country I go to, I always think the most fun part of a trip is doing something like a homestay. Not just tourist attractions or places all tourists visit in that country, but I would love any opportunities where I can understand and learn its local culture. Well, please invite me some day. Q. I think if you accept homestay invitations from all your fans, you might have to stay here for another two years. JG – Sure, I will stay as long as possible. - Q. In 2019, what project are you preparing? What’s your plans this year? JG – First off, thanks to your big support, I’m able to finish my Asia tour really well with Hong Kong as its last stop, so I am truly grateful. I think I can see you guys again with a new project, maybe, sometime in the second half of the year. I am thinking really hard about what project I should choose. Perhaps, tomorrow, on my last show in Hong Kong, I am hoping to get a lot of energy, enough energy for me to choose a great project. You guys are going to give me that energy, right? Please give me some energy. I think it’s going to be great. - Q. What part of Hong Kong do you think is most attractive? JG – I mean, Hong Kong is famous for being one of the world’s most beautiful cities. It’s a city where I want to live once someday. I think every person is very unique in their own way. Many cultures coexist, and passionate and beautiful people mingle and blend into the city. I think I can feel that kind of harmony here. Anyway, I think Hong Kong has such harmony to it. (JG tries to repeat translator’s words in Cantonese) - Q. You really have a talent in Cantonese. JG – Is there any popular word in Cantonese used by young people? Like, words used by lovers. (JG tries the Cantonese word) What’s it mean? (JG speaks Cantonese) But it shouldn’t sound so… Make me sound not so humble, should it? (Fans cheer) (JG thanks them in Cantonese) What’s “I really, truly, sincerely am grateful” in Cantonese? (JG tries the Cantonese phrase) - Q. What do you do in your spare time, outside of work? JG – Nowadays… I have always loved martial arts. The reason I love martial arts is because, as I said before, I watched a lot of Hong Kong action movies in my adolescence. In fact, the reason I love action when working on a project is that I grew up watching a lot of Hong Kong action movies, I sort of internalized it [the experience of watching such movies]. So nowadays, I fell in love with jiu jitsu. When I don’t have any schedule, I always make a habit of going to the gym to train my body and mind. - Q. You’ve worked in many genres. Which particular genre do you want your fans to see you in? JG – My fans want to see me in the romance genre as soon as possible. My face still looks good. So my fans say, ‘While you still have that beauty, do [the romance] as soon as possible.’ I also keep looking for such an opportunity, and I am giving it a lot of thought, so please look forward to it. - Q. So your Asia tour is a great gift you are giving your fans. Today, there’s a special gift your fans prepared for you. JG – What? Surprise? 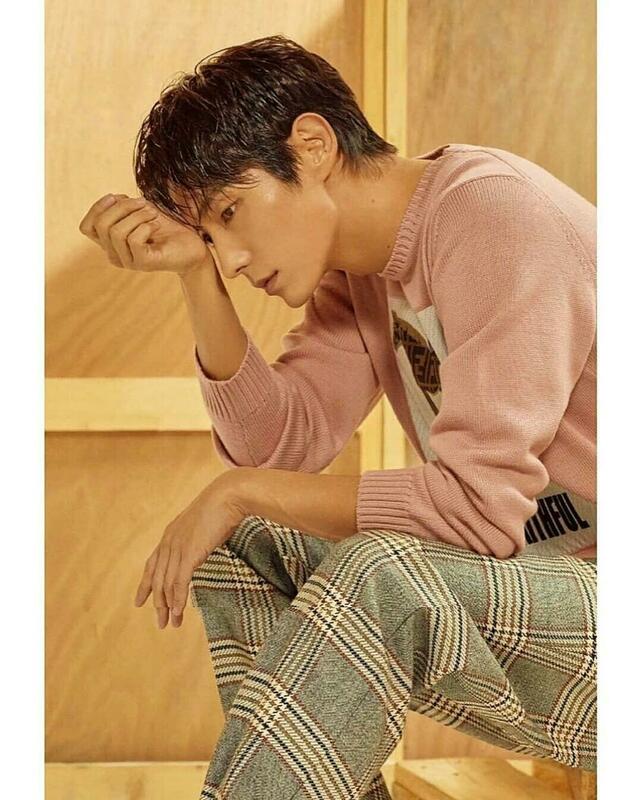 - Q. Lee Joongi, you have also done many good deeds with charity organizations… From 2015 to 2019, the fans have donated funds to a great organization. So we are handing that plaque of appreciation over to you. JG – Thank you. Thank you so much guys. I’ve actually heard a lot about it. I always learn a lot from my fans. I will lead by example and work harder to spread and share the big love that you have given me. (Receiving the letter of appreciation) Thank you. - [Photo time] JG – Thank you so much guys, thank you. - Q. You have participated in a lot of charity projects. How do you feel (*not clear) every time you do it? JG – First of all, as for these good acts of spreading love that I do with my fans… I think I am so blessed. Even in countries where I was not born, as my Hong Kong fans have done for me, I am receiving big love from diverse groups of people, and I am living such a blessed life. I think that’s why I have gotten such a great opportunity like this [to spread love]. I am sincerely thankful. It’s not just me… But you guys are here because you love Korean culture. I will work harder with a greater sense of responsibility and gratitude, so I can lead by example and contribute to cultural exchange between Hong Kong and Korea. I thank you from the bottom of my heart. - Q. Now we are allowing the press and fans some photo time. JG – Should I then put this (letter of appreciation) away… (To audience) You’re done taking photos of this, right? Thank you so much guys. And the mic too? - [Photo time] - JG – Thank you from the bottom of my heart. Tomorrow, finally, finally! Tomorrow night. Are you guys ready to party? Please look forward to my 2018-2019 Asia tour last show. Tomorrow night, in Hong Kong. Okay? Please come to my party. Thank you. Thank you Hong Kong, love you all. Love you. Thank you. (To translator) What’s “I love you”? (JG speaks Cantonese) See you tomorrow, and good night. Thank you so much. Thank you.